President Trump’s $4.1 trillion budget proposal for Fiscal Year 2018 seeks massive cuts to critical programs that help American children and families. It takes aim at all areas of life that impact kids: health, education, poverty, housing, immigration, and foster care. The Trump budget includes approximately $1 trillion for discretionary spending. It slashes funding for the Department of Health and Human Services (HHS) by 16 percent. It cuts 14 percent from the Department of Education, 12 percent from Housing and Urban Development (HUD), and eviscerates Medicaid to the tune of $1.5 trillion. 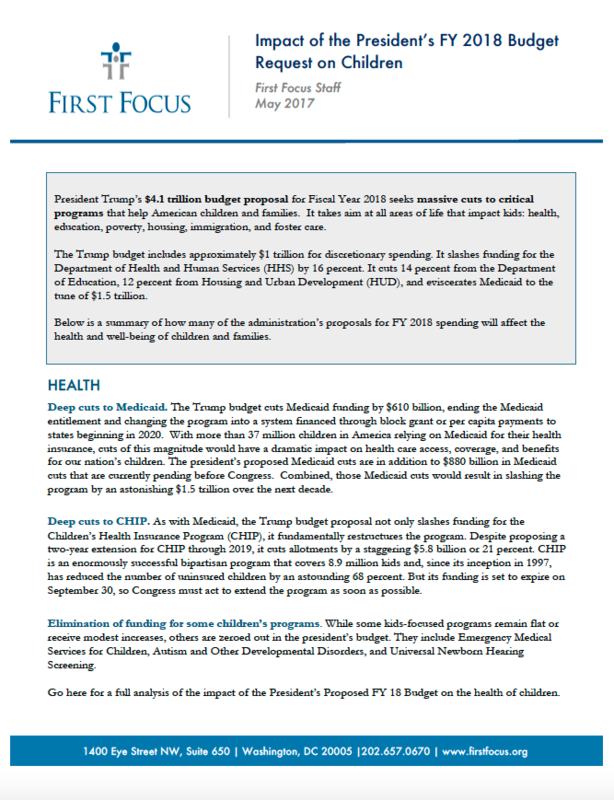 Below is a summary of how many of the administration’s proposals for FY 2018 spending will affect the health and well-being of children and families.